Hello it's Gracie! Days are going by so fast and Christmas is right around the corner, so there's only a few more days left to make beautiful Christmas projects. 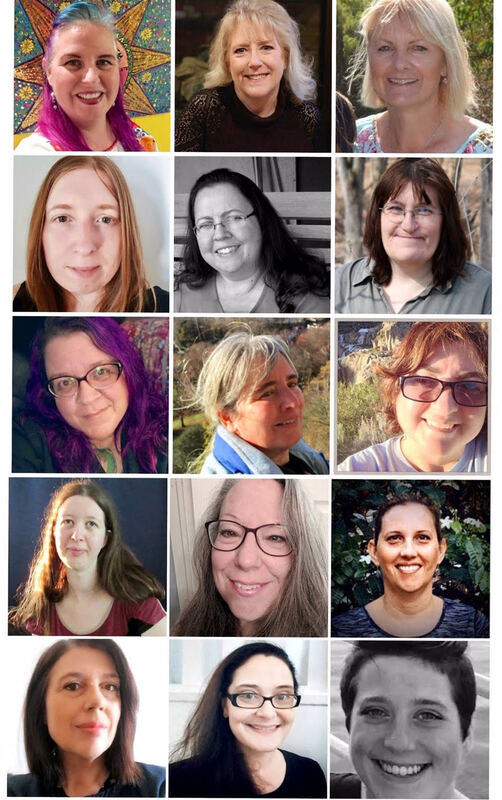 Today I have a tag to share with you. 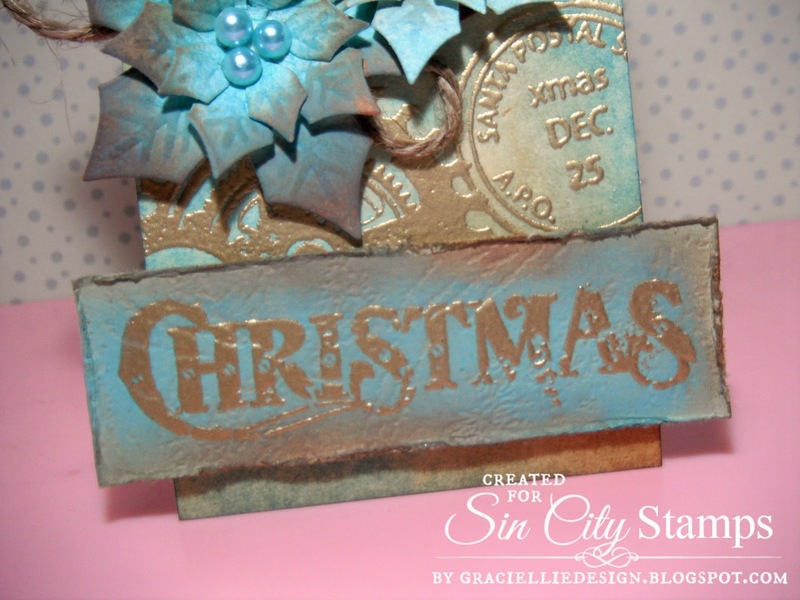 To make it I used a very nice stamp set from Sin City Stamps called Steampunk'd Christmas. I honestly love how this tag turned out. 1. Stamp and heat emboss in gold the largest gear stamp on a beige cardstock tag. I stamped it twice. 2. Stamp and heat emboss in gold a post stamp on the tag too. 3. 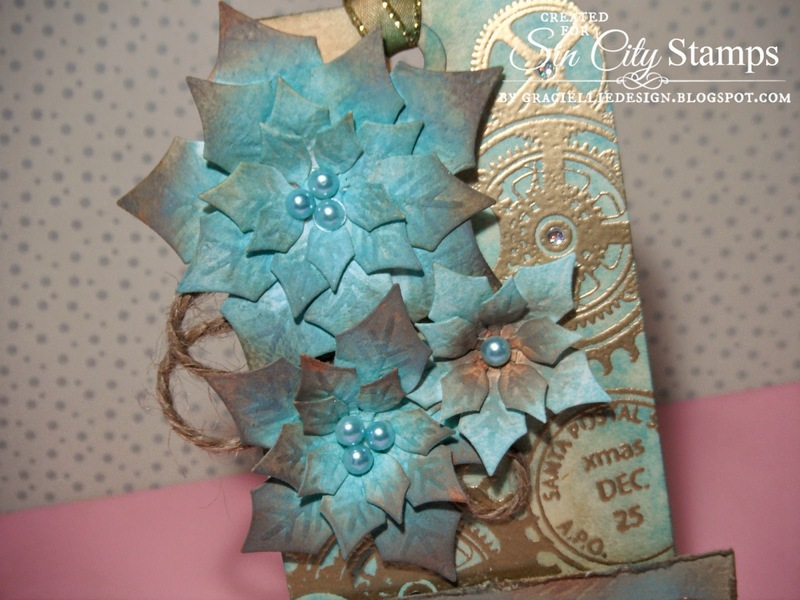 Apply Crafter's Ink in Aquamarine and Distress Ink in Vintage Photo to the tag using a sponge applicator. 4. Die cut three poinsettias in white and sponge with ink to match the tag's background. 5. Embellish the poinsettias with aquamarine pearl stickers. 6. Stamp the Christmas word sentiment to a piece of beige cardstock and cut a banner. 7. Apply inks to the banner to match the rest of the design. 8. Double mount the sentiment banner to the bottom of the tag using foam adhesive. 9. As a final touch, add jute twine around the poinsettia bouquet and a piece of gold ribbon to the tag eyelet. I roughly sponged aquamarine ink the the gold ribbon to give it a vintage look. 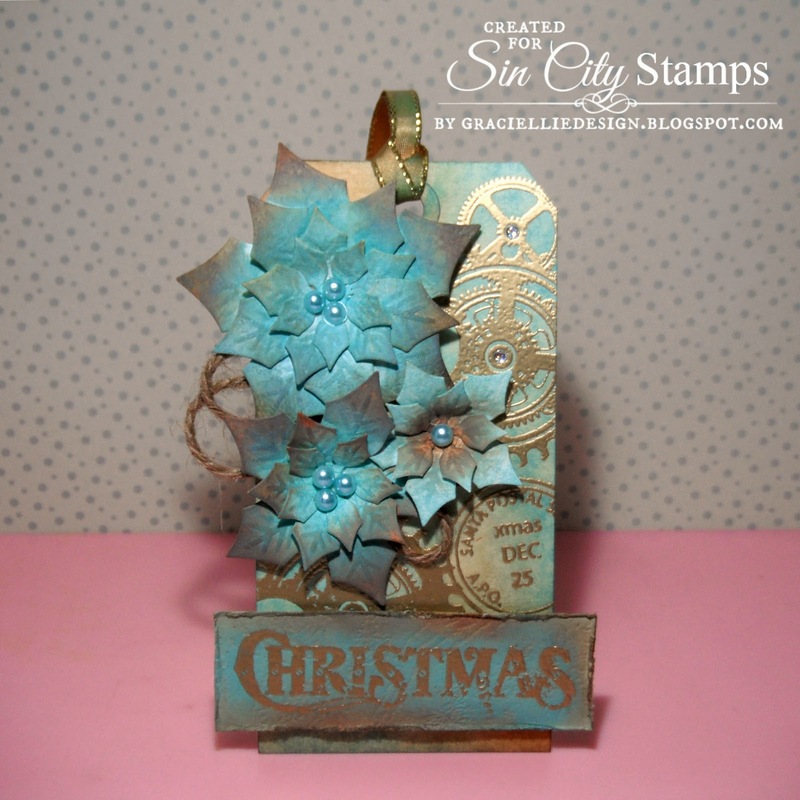 The Steampunk'd Christmas stamp set is so versatile! 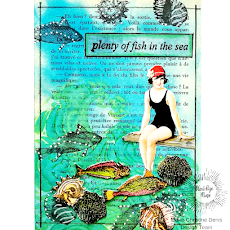 It gives you so many options to create both backgrounds and focal elements on any paper crafting or mixed media project. I hope you liked my tag and tutorial. Thank you for stopping by! OMG.. I love it!!! IT is beautiful!!! Absolutely gorgeous tag, Gracie! I love it!!! Stunning!! I just love this tag!